The concept of Project33 is to have the basic "bad boy" look and feel of a traditional hot rod but with high-tech features that improve safety and performance. This blend has been described as "eclectic traditional". Whatever you choose to call it, there's one thing it definitely needs… round gauges with chrome bezels - no billet or brushed aluminum. 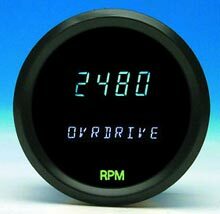 As much as I like digital gauges, I still want a traditional gauge look, so Dakota Digital and yours truly have come up with a system that's going to blend the best of old and new, traditional looks and current technology. The Harley in the background is one of Dakota Digital's test bikes. Dakota Digital makes a dual 4.5-inch round 5-gauge system called the STR1004 (pictured above). It features the new Series II control box for easy speedometer calibration and system set-up. It has adjustable 0-255 mph speedometer, user adjustable warning points for tachometer, oil pressure and water temp, built in indicators for high-beam, turn-signals, brakes, check engine, and a gear position indicator. All this in two 4.5-inch round gauges! The newest gauges in their line are the new Odyssey Series II individual round gauges. They come in industry standard 3-3/8-inch and 2-1/16-inch sizes. We will use 3 of the small ones for boost, transmission temp and EGT, and a 3-3/8-inch tachometer will be placed in a Mullins polished billet tachometer mount on the column - just like the old days. The billet tachometer mount should go great with the polished Flaming River 1-3/4-inch diameter column and 3-spoke "Lakes Style" steering wheel. Our goal here is to make it appear that the car has traditional analog gauges when the key is off. To achive a traditional look we need two things - chrome bezels and traditional looking faces. This is where the parts bin exploration came in handy. 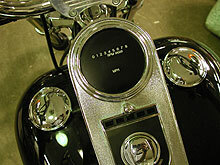 Dakota Digital's Harley-Davidson "Fat-Bob" style speedometer uses a 4.5-inch chrome bezel and their Odyssey Series II sets for Harley have chrome bezels! I laid them out on the dash and it looked…"just right"! Dakota Digital doesn't make the three small gauges (boost, trans temp, EGT) in the Odyssey Series II … YET, but they are going to for Project33 and so they will be available as part of that line in the future. I will be designing the faces on my computer and Dakota Digital will engrave them in their shop. 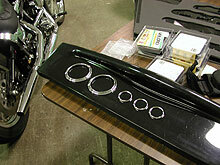 I plan to show you the entire build-up of the custom gauges in Dakota Digital's factory in some future articles. I've been working with Dakota Digital on some other ideas for various other parts of the project but I'm sworn to secrecy until they are unveiled. You'll just have to keep coming back to see what's up. This project is getting more fun all the time! Oh, I probably should mention, the dash is the smooth fiberglass unit that comes with the Outlaw body.